"United Church Seminary gymnasium, St. Paul, Minnesota"
A common practice in the early part of the 20th century was to have photographs printed on "picture postcard" stock. 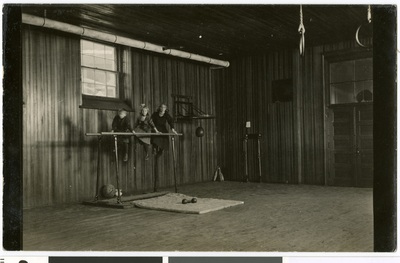 This photo, from the Constance W. Johnson collection, shows the gymnasium at the United Church Seminary. Three children are posed on the parallel bars. Some equipment items shown are: parallel bars, free weight, punching bag, juggling pins, rings. Back of postcard reads: Gymnasium, Bockman Hall, Luther Theological Seminary, Constance Weswig Johnson in center.